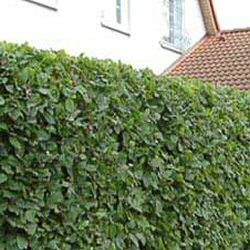 Buy Hornbeam Hedging (Carpinus betulus) online from UK tree supplier of cell grown broadleaf hedges and shrubs. Hornbeam (Carpinus betulus) is an attractive, native, British hedging tree. Frequently mistaken for Beech (Fagus Sylvatica) in its appearance, the leaves of Hornbeam are recognisable as they have deeper veins. Hornbeam is a hardy hedging species and is semi-evergreen, it keeps its brown leaves throughout Winter. Green catkins are present in late Spring until Autumn. These are attractive for wildlife. We recommend trimming Hornbeam in late Summer as this helps it to keep its Winter colour. Hornbeam prefers a sunny position, however it is shade tolerant and copes with wetter soils, however we would advise against planting near the coast. Our Hornbeam hedging trees are sold as plug plants, in other words the roots are encased in compost. This means that planting can be carried out at any time of the year, provided they are watered in periods of drought, compared to bare-root plants which can only be planted during the plants normal dormant period (November to March). All of these trees are UK grown, which is important for successful establishment. How many Hornbeam hedging trees do I need?